I haven’t been up a mountain for a long time, and I’ve missed it. I hadn’t realised how much until Tuesday last week as I stood at the summit of Lochnagar listening to the immense silence and thinking – what am I in comparison to all this? My brother and I had come to scatter my dad’s ashes. It’s probably fair to say that dad was his happiest at the top of a mountain. The bigger, wilder and harsher the landscape and wider the view, the happier he was. Lochnagar is one of dad’s old haunts, and he used to climb it on summer solstice to watch the sunrise. My brother and I planned to do the same – spend the night on the peak, watch the sun rise on the longest day and say goodbye to our dad. But I was feeling a bit fragile (too much cider at the Insider Festival – dad wouldn’t mind) and the nice woman on BBC Radio Scotland forecast heavy rains and high winds, so we set off in the early morning drizzle instead. We followed the path from Loch Muick up through the silent Scots Pine wood and into the dark mass of hills. 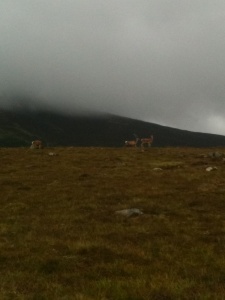 A group of stags stood their ground to the right, watching and chewing, as we passed. A couple of grouse shrieked and jumped out of the heather. The burn, full and fast with the rain, crashed its way through the glen, as brown and frothy as real ale. The wet gravel crunched underfoot, a familiar sound and a trigger of memories. I’ve walked up this mountain many times with dad – him in front with his hands clasped behind his back – the only sound the steady crunch, crunch of our footsteps. As we neared the top the temperature dropped and sent an icy breath down my back. The wind picked up and swirls of low clouds, smoky and sinister, chased up the mountainside, tendrils clinging to the bulk. We picked our way through the boulder field and scrambled up the final leg, happy to see the rough pyramid of stones, the cairn, that marks the top. To the right the crag drops vertically, steep and long. Today it was masked by the mist. Mum’s last words to us as we set off this morning rang in my ears: ‘Don’t walk over the edge’. 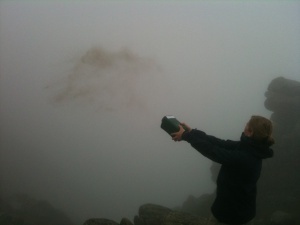 We stood on a rocky outcrop and hurled the ashes off into infinite space, and dad became part of the mountain. Afterwards, as we hunkered by a rock drinking coffee, my brother said: ‘Bloody hell, coffee tastes so much better at the top of the mountain’, which is exactly what dad would have said. We looked at each other for a moment and then rolled around laughing. ‘You’ve swallowed some of dad’s ashes – he’s possessed you!’ But then aren’t we all possessed in some way by our parents, good and bad. My dad’s love of mountains was passed on to me and remains there, set as hard and immovable as a chock stone. Quite what it’s about I don’t know (mountains are, after all, just lumps of rock and ice), but it’s there and it’s real even if some of it’s unexplainable. Mountains balanced dad, and they do the same for me. They speak of a durability that puts my tiny life in perspective: how fleeting and insignificant I am in this vast vista of time and space. In day-to-day life I can ignore this thought, but up here it hits me like a shot in the arm. And this, I think, is a good thing. 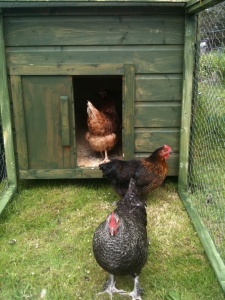 Finally I’ve bitten the bullet (or should that be pullet) and three chickens and a hen house have arrived today. I was slightly nervous about being responsible for three fluffy lives, but they seem quite happy clucking around their new home. They’ve to stay in their house until Saturday and then they’ll be ‘homed’, so I can let them run free during the day and they’ll settle themselves back into the house at night. I’ve talked to a few neighbours who keep poultry and apparently I need to watch out for pinemartins and mink. The hardest decision was – which hen house? I’d been warned against anything off the internet (fine for down south but not tough enough for our west coast winds). I didn’t want to spend a fortune, but I didn’t want something knocked up out of two old pallets and a sieve either. I visited a few poultry centres locally to get an idea of what’s on offer and immediately liked the people at Doune Traditional and Rare Breed Poultry. John, who runs it, gave me lots of good advice and put together a simple package – three point-of-lay pullets (hybrids – one orange, one black, one grey), one solid hen house, a run, a bag of feed, a bag of wood chips, a feeder and a water dish all delivered to my door and erected for a grand total of £290. John specialises in breeding Scots Dumpies, a cute stumpy-legged rare breed of hen that I rather fancied, but he recommended starting out with a few nice hybrids – they’re better layers, friendly beasts and easier to look after. I’d also been after two hens, but John will sell a minimum of three. They’re sociable creatures, you see, and if you only have two and one dies, the one left alone will be miserable. And that’s always a risk with pinemartins on the prowl.